Moving into a new home is an exhausting, time-consuming process, especially if you end up running out to the store to pick up forgotten items, such as bathroom essentials. Whether your new house is your first or simply your latest, fresh bathroom accessories help transform the place into a home. Select linens and decorative accessories that reflect your personal style, and don't forget to pick up a supply of toiletries and other bathroom necessities. Bathroom accessories come in myriad styles, from the traditional to the kitschy; however, not all are equal when it comes to quality. Before you get suckered into buying those chic Parisian-print towels or that bathroom set embellished with adorable rubber duckies, inspect the quality. Bring snapshots of your new home's bathroom floor, wall color and sink vanity to assist in selecting accessories that will coordinate well with existing fixtures. Bathroom accessories designed to be decorative include shower curtains, wastebaskets, soap dishes and dispensers, toothbrush and cotton ball holders, no-slip rugs, toilet seat lid covers, bath mats and towels. Opt for accessories designed to match, or select individual pieces from several complementary design styles. Unpacking boxes and lifting heavy furniture can lead to all sorts of unexpected injuries, not to mention the injuries and illnesses that will come after you've settled in. Pick up a first aid kit for your bathroom, or assemble one yourself to be ready in the event of an emergency. Stock your new bathroom with bandages in a variety of sizes and types, antiseptic for disinfecting injuries, aspirin, burn and injury ointment, instant cold compresses, a thermometer and a tweezers for removing slivers or debris from wounds. Plugged drains and toilets present a different type of emergency, so make sure to keep a plunger handy. Many bathrooms have small windows, or none at all, which is why every bathroom should also have a flashlight with fully charged batteries. Brand-new bathroom accessories deserve a home that's fresh and clean, which means you'll need cleaning supplies to clean the space. Determine the type of materials your bathroom fixtures are made of in order to ensure that your new cleaning products won't damage their surfaces. Separate products may be needed to clean the sink, toilet, tub and shower areas. Remember to get cleaners for the mirrors and floors, too, as well as products designed especially for tough toilet-bowl stains. Pick up sponges, cleaning cloths and mops designated solely for bathroom use, to keep from spreading bathroom grime throughout the house. Organization is another key to cleanliness, so add to the checklist storage systems for the shower and under the sink, along with wall shelves and towel racks. 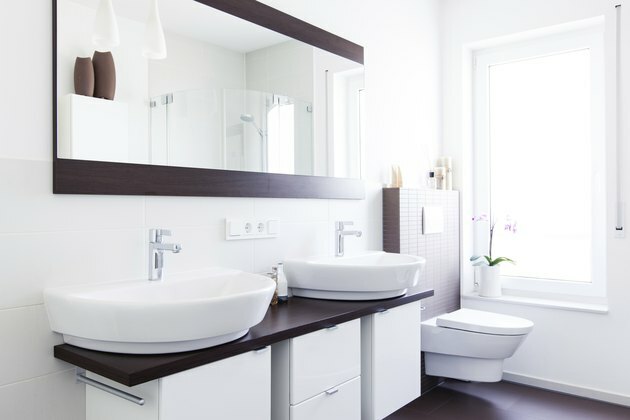 With all the things a new bathroom needs, it's easy to overlook the toiletries you and your family might want. Add to your bathroom must-have list all the common-sense products you might forget, such as toilet paper, light bulbs, cotton balls and swabs, shampoo and conditioner, toothpaste, toothbrush, dental floss, mouthwash and soaps. The bathroom checklist is also the best place to list essentials needed for grooming, in case you need to go out in public before you've completely unpacked. This includes lotions, shaving paraphernalia, hair-styling tools and products, cosmetics and deodorant. Kids have their own set of needs, especially when it comes to equipping a new home's bathroom. Toddlers require childproof locks for the toilet and bathroom cabinetry. Remember to pick up potty-training devices that fit your new bathroom, as well as any tub accessories needed for bath time. Invest in a step stool for older children who might still need help reaching the sink or getting up onto the toilet. Help little ones acclimate to the new home after dark with a nightlight featuring a festive or simply familiar design.